Since the one day symposium last year on the architecture of the 1980s, I’ve been paying more attention to buildings from the 1980s. 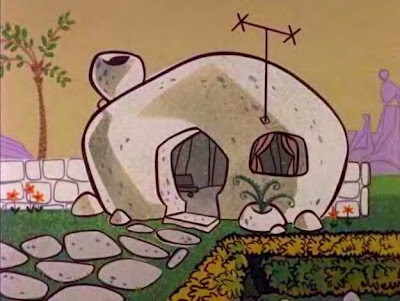 At first I was somewhat incredulous that we should be looking to celebrate the architecture of that decade so soon after it occurred, but then I realised that as the birth decade of full blown PoMo in NewZild, there are going to be a few classics thrown up, as well as a fair bit of Rheineck. There are of course many tall buildings around the city, with obligatory classical references, and pointy tops, and all manner of pediments and impediments to good taste. The ‘Modern’ and all its good building manners were, briefly, thrown out with the sawdust, but thankfully, they seem to be back now with a vengeance. Some people at the conference were discussing 80s housing, others 80s multi-culturalism, 80s mock-deco, 80s mock-doco super-soap Gloss, and there was even a brief flirtation with 80s Chase Corp buildings. Most of the 80s were, as far as I can gather, spent dressing in pink and grey, with big hair and bigger shoulder-pads. Since then, the buildings have mostly been re-facaded, re-painted or de-molished. But, no doubt, one day even some of these buildings will be considered for listing as examples of ‘the Decade that Taste Forgot‘. It got me wondering: What’s your favourite 1980s building? One of my favourites is the building formerly known as Hallensteins in Cuba St, resplendent in poly-chromatic blockwork. Although Hallensteins themselves have shuffled off down to a busier corner, the building still retains the mark of the H on its walls, and has been promising for about a year now that a new shop-front is coming soon. Personally, I don’t see anything wrong with the old one. I’ve absolutely no idea who might have designed this building, although I have a feeling that it may have been featured in an Architecture NZ magazine from decades ago, when the blockwork was crisply white and pink. It must have been an architect, as the blockwork is all stack bonded. My guess, from the particular shade of pink used, and cross-referencing it to Simon Praast’s socks in Gloss, would be 1987. The building itself is, the more I look at it, an 80s version of a 30s deco style. 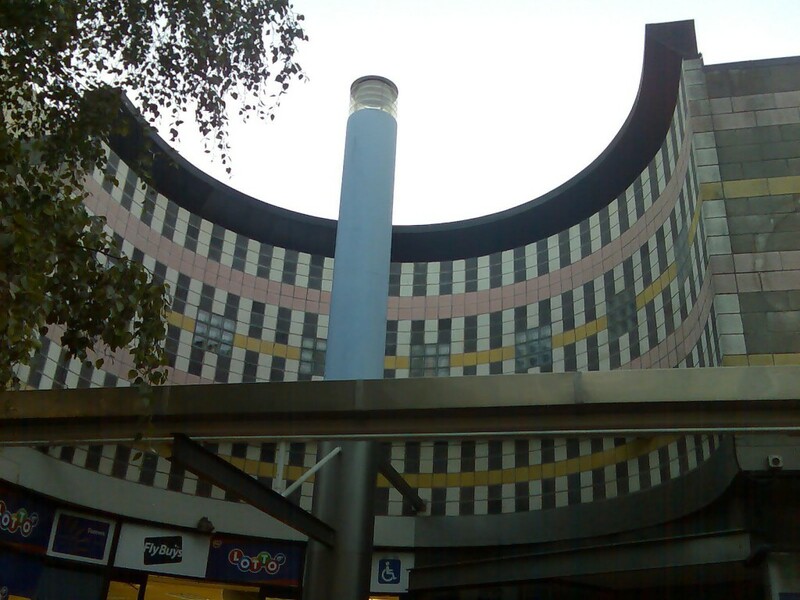 The lighting column out the front is similar to the lighting pylons marking the entry in some 1930s buildings, the curved recess of the entry space sits respectfully around that column, the curved and gridded bands of checked black and white blockwork, the four small squares of glass block, and of course the banding of pink and yellow blocks – this design is, I believe, completely unique in New Zealand. It brings a smile to my face each time I see it, and with a bit of luck and an enlightened owner, a decent clean-up would see it getting the recognition that it deserves. So: What is your favourite 1980s building? Speaking of things that taste forgot, just briefly, before the Oscars are announced tomorrow – is it just me, or does anyone else agree that Avatar is one of the worst films ever made? The film stock may be 3D, but the script doesn’t even make it to 2D. Out ranked in its pap loathsomeness only by Titanic of course – shudder – they’re just so badly scripted and mawkish in their enforced overly patronising way. Is there any real reason why a completely different evolutionary path from earth, mammals and humans, should give the people of whatever make-believe planet it is, stunning good looks and pert bosums and just the addition of plug-in hair and blue skin? 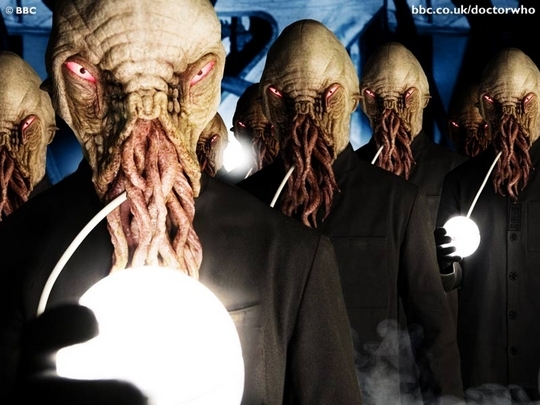 Give me Doctor Who’s aliens any day. I believe that the Hallensteins shop front is down to Stuart Gardyne – perhaps via Structon Group. I’m fond of the building on the corner of Willis and Willeston – not the BNZ Tower, the other side of the road. There was a fabulous 80’s ‘exploded’ building just up the road from me in Parnell, Auckland – a villa that had been ‘exploded’. I took quite a few pictures of it as I knew it was going to be demolished by sigh, yes, a developer who only cares about money. That lighting column, when viewed from above (ie in the pub across the way playing pool) always reminded me of an unlit cigarette for some reason. Never saw the light on, though. Christopher, you can always email us at contact @ eyeofthefish.org Looking forward to seeing the pictures. Robyn, that one was called the CML building a few years ago, but now seems to be owned by Sovereign. Yes, that got an award or two at the time, – including an NZIA National award no less, and was designed by Structon too (thanks for the info on the Hallensteins link Starkive). They did pretty much all the buildings in town at that stage. 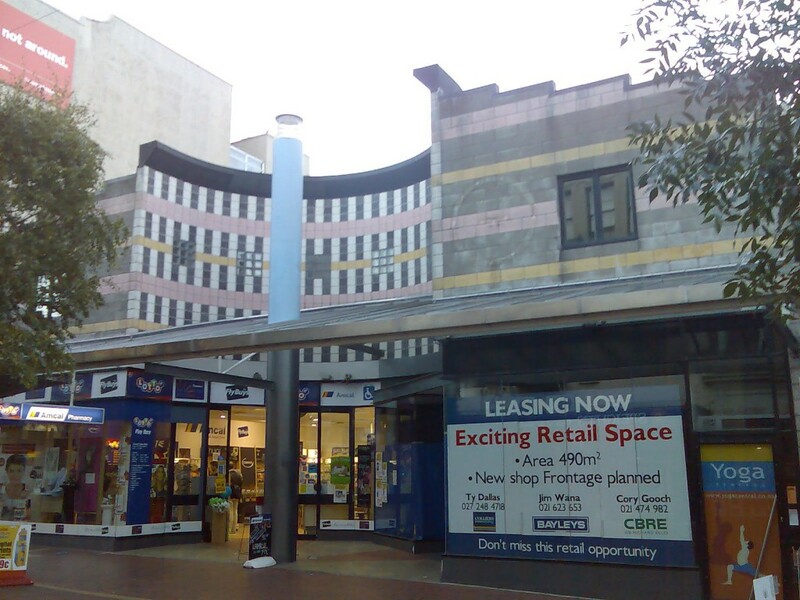 Apparently this one replaced one of Wellington’s finest Art Deco buildings, now long gone. If you’re looking for words to describe the modulations of the inverted castelated fenestration, then you’re out of luck. I think the building worked successfully as a mirrored object, but until it was fixed recently, it had the most awful cocked-up ground floor, with a weird stepping down into the foyer lobby – there must have been a real battle over headroom to force that on them. It is, still, so distanced by the mirror glass. Imagine if we could see signs of life within! 60, unlit cigarette eh? or even a tip of a pool cue? There’s a lighting pylon just like this in Napier, at the corner of Shakespeare Rd and Hastings St, on an old Deco building, that used to be the Ministry of Works…. The light either shines out around benevolently, or else beams up like a Nuremberg searchlight. Another 80s building – Compudigm House in Boulcott St – makes me smile every time I see its mirror glass pediment. The CML building cnr. Willeston/Willis Streets was designed by CCM. The Athfield buildings of the 80’s would be the Hewlett Packard Building, Upper Willis Street, and the Green Tiled Telecom House on Manners Street, plus Te Mata Estate, Havelock North. The Darrrock & Co building next to First Church of Christ Scientists also was a really goods alteration/addition by Ath/team. They would be some of the best from that period. Caspian, you’re right about most of those, but not the CML building – according to Kernohan’s book on Wellington buildings, it was definitely Structon. Mind you, Athfield worked for Structon for his early years, so he could have been involved. The link doesn’t take you to anywhere in Boulcott St. Yes I was the design architect of the Hallensteins facade, whilst I was at Structon Group. It is a two storey frontage grafted onto a very long deep building that is part of the three storey building fronting Ghuznee Street that Grace hairdressers occupy. Service access to the Cuba Street retailers is via the Ghuznee Street building. I think the art deco reference Maximus noted is pretty close to the mark. Ross Brown of Structon Group was the design architect for CML. It was not CCM as Maximus has already confirmed. There were two stages to that project. The first being the tower (a fabulous building) on the corner of Victoria and Willeston, and the second the lower building on the corner of Willis and Willeston. The ground floor level changes etc. are the result of the expectation, and Ross’s intention, that the original 30’s building would remain. He, like most of us, was very disappointed when Colonial Mutual decided to demolish it. I’ll send an image. stuart g – thanks for that – excellent stuff – we’ll use that in a separate post. Re the Hallensteins bldg – was I right on the year? Nooooo! We were only kidding Kerry ! We suggested this back in November 2009 – and now its happening! Mistaking Ironic for Iconic once again…. I’ve emailed the images to you of the 80s ‘exploded’ building. I remember when the Hallensteins building was built and to be honest I can really recall the architecture as the store itself kind of over-rode everything. I remember when the green Telecom building was built and finished – my oh my – so green!! Everything was. It was a mystery why, but I guess in hindsight given that the govt sold Telecom for a pittance and the o’seas owners basically raped it – green is the colour of the greenback. I remember visiting someone who rented one of the apartments on the side – so green inside!! Well, sort of. I think the 80s are due for a major retrospective. Hallensteins has got a relocation sale on at the corner shop at the moment and have leaflets proclaiming that they are shifting to 91-95 Cuba Mall (the old Hannahs store?). The funny thing is, is that they say they are leaving from 120 Cuba (the building with the glowing phallus).